Can I Export Timesheets That Aren't Approved? Yes--but if you have timesheet approvals enabled, ClockShark will alert you if you attempt to export unapproved time. If you have timesheet approvals enabled and you're exporting time to one of ClockShark's integration partners, ClockShark will alert you if any timesheets are not approved. Visually, unapproved timesheets appear plain yellow and do not have the green "Approved" icon. 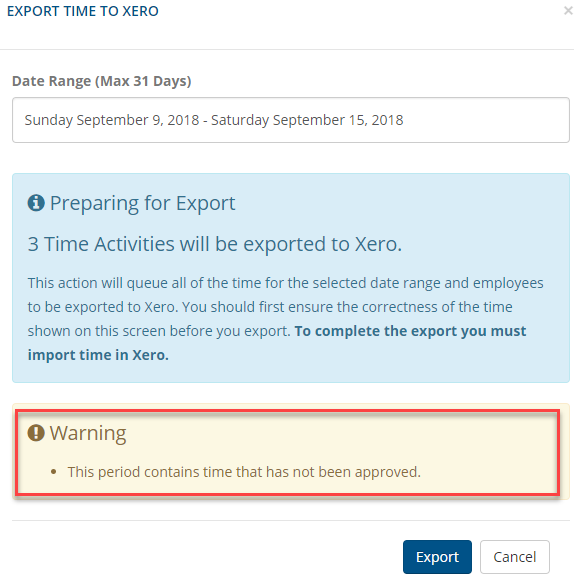 When you click the "Export" button, if any unapproved timesheets are included in the export date range, a yellow alert will appear on the screen. Note: Since the alert is yellow, you will not be prevented from exporting time, even though it is not approved. This is a non-critical alert that you can choose to ignore to export time, or address before continuing. To approve the unapproved timesheets, click "Cancel" and navigate to Timesheets > Approve Timesheets and click the blue check mark for the employee's pay period. You should see green "Approved" icons on the employee's timesheets afterward. In this scenario, if you only wish to export approved time - all the timesheets are approved and locked, and can be exported to your accounting payroll software. Read more about setting up timesheet approvals here.